I am finally posting some photos of our “Small Quilts from Antique Inspiration” at Maine Quilts 2016. Cyndi Black and I organized an exhibition of little quilts and the antique quilt that inspired them. I hope you enjoy the photos. First off, Cyndi Black (BusyThimble) with her magnificent potholder reproduction. What a sensational job! The original was on loan from the Maine State Museum in Augusta. drape it over a rack. Sue Rivers reproduced her magnificent Irish Chain with swag border. Oh how I want to make this little gem. She did a fabulous job! 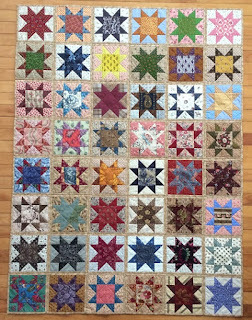 Pat Burns reproduced an Amish quilt in the collection of our friend Judy Roche. Suzanne Bruno made this fantastic tea cozy to represent her crazy quilt. What a great idea! 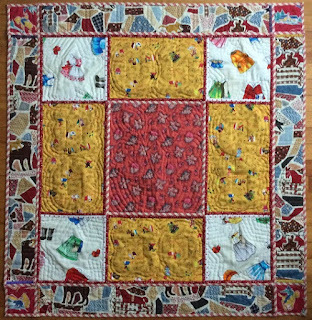 Diane Dixon chose to make this adorable little pyramid quilt. The original had some of the most wonderful wool challis’ in it. Great job! Bonnie Dwyer made this red and white Bear Paw. Just above that is a quilt made by Ann Reed (not pictured, she snuck in and out too quickly for a photo) from a quilt in the Henry Ford Museum. The two quilts were striking. It was our “red and white corner”! 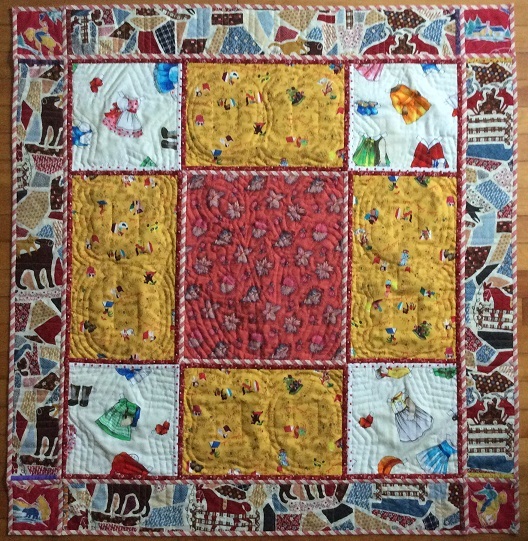 For some reason I was not able to catch Mary Reynolds for a photo, but she made this beautiful rendition of a quilt in the collection of Judy Roche. I was in awe of the Compass Rose, but Mary said it was the feathered star that gave her fits. 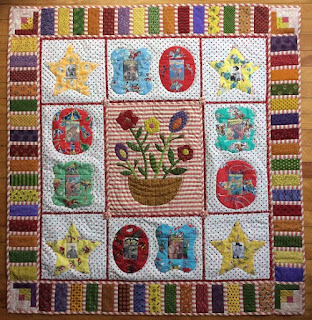 Dawn Cook-Roninngen (Collector with a Needle) and Jeannanne Wright made two tiny little quilts from the incredibly inspiring original from Jeannanne’s collection. They even hand dyed the backing to be more authentic. I think if I had my pick of any of the antiques, it would have been this one. Hmm… maybe because of the cheddar? Florence McConnell made this exquisite "Carolina Lily" quilt from one in her collection. What a fantastic representation. 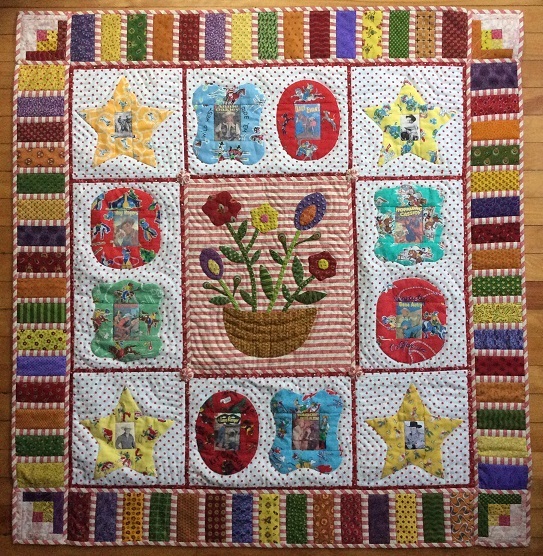 Florence has participated in the AQSG study quilt projects in the past and her work is stunning. Nena Cunningham made this little gem from a quilt I have owned for years. I am a sucker for medallion quilts. Nena did a fantastic job! 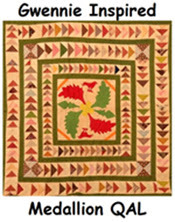 This is Karen Keeler’s interpretation of this wonderful turn of the century Churn Dash quilt. Love the scrappy look! And finally, yours truly. This antique inspiration was so unique that I just had to reproduce it! Forty Five minutes after the show closed, this is how it looked. See you next year! Thanks to everyone who participated. 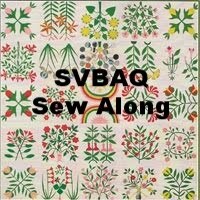 One of the best parts of our show this year was meeting up with Blogging friends, Gladi Porche (Gladi Quilts) and Cynthia Nanto (Wabi-Sabi Quilts). One more boat show this weekend and then I can relax and get back to a normal 40 hour work week and cooler temps for quilting! 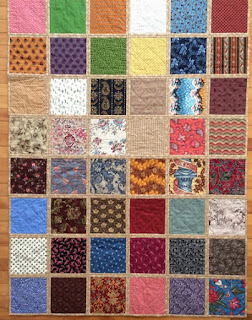 I should be posting photos of our wonderful “Small Quilts from Antique Inspiration” exhibition this past weekend, but I am shipping this one off this week so I wanted to post it. This will be going to the American Quilt Study Group for the auction at the annual seminar in Tempe, AZ. These were done in the potholder style which lent itself very well to the project. Since each week we were to learn about a specific fabric, I was able to use it for the stars on the front and represent it on the back of each one as well. Two chances to get it right! I had so much fun with Barbara and others who joined in. I think we all learned a lot about our magnificent 19th century fabrics. I know that part of the lesson was to go out into the quilt shops of today and search for the correct fabrics. Because of my wonderful relationship with Cyndi at the Busy Thimble, I will admit, I did NOT have to go shopping. However, I might have had trouble with the quercitron arborescent chintz, had I not actually been at Cyndi’s the day Barbara announced it. I was convinced she made it up, but the yellow bolt arrived the very day I was there! Yes, a day late in posting this, but still oh so much fun. 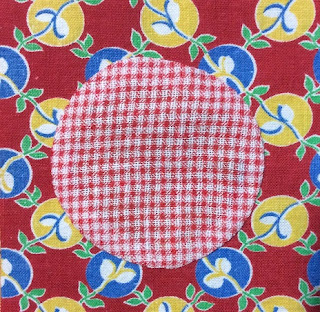 Since November 8 I have started every morning with a little circle applique. Ten minutes of pure happiness each morning. My little circles are like Frosted Flakes, they’re great! Here is my August 1st block. Happy little thing isn’t it? They are really adding up! Nothing says happiness like vintage feedsack fabric! 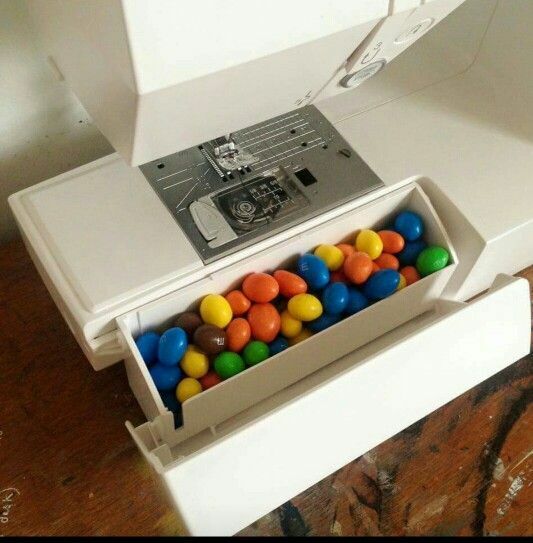 Since I do most of my work by hand, I'm not all that familiar with all parts of my sewing machine. I just recently found out what this little drawer is for. How delightful! I think I will be doing more machine work in the future. I hope you are all enjoying your journey as well. Thanks Audrey! I am making this in the potholder method whereby each step has to be quilted and bound before I can add the next border. 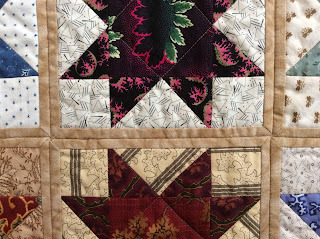 The center and first border are hand quilted. I work in a marina/boatyard and July is our busiest month so I was so very thankful to Cathy for choosing something that I could do on the machine relatively easily. I took it a step further by simplifying the “log cabin” into simple “logs” along the sides with 4 little log cabin corner blocks. Since I sort of cheated on the sides, I backed the strips with a “cheater cloth” print. Then I used a vintage cowboy feedsack to back my corner blocks as it had an image of a sweet little cabin on it. Had to get those log cabins in there somewhere! I used the background fabric from my center for binding to add a little continuity to this jumble! Katy (Katy Quilts) has chosen “stars” for our next go round. I am really looking forward to seeing what you do with it! 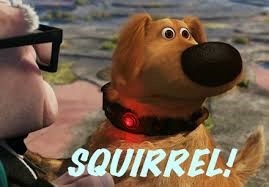 I am amazed at all your creativity! 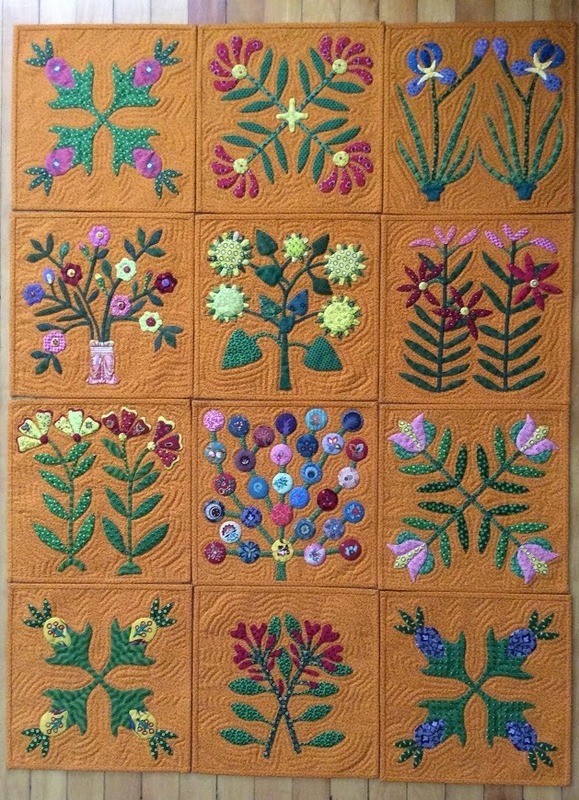 Please visit Katy Quilts to view the rules and see all the wonderful work. I’m still having fun this one and I hope you are too! I have so much to post about our annual show that ended yesterday, but no time this week to post. Do check out Cyndi's blog (Busy Thimble) as she will be posting too. More to come.